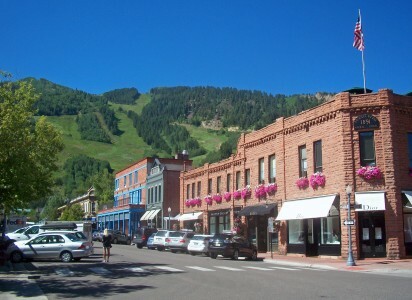 The 80-mile corridor between Aspen and Parachute in western Colorado exemplifies a national trend — wealth disparity creates educational inequality that leaves many students unprepared for college or career. 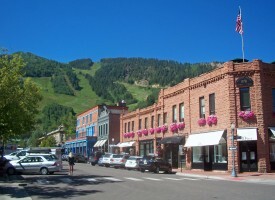 In the greater Roaring Fork Valley, more than half of children are not ready for kindergarten and only 73 percent of low-income youth graduate from high school. In 2012, the Aspen Community Foundation (ACF) recognized that this problem reached beyond the classroom and launched the Aspen to Parachute Cradle to Career Initiative (CCI). The program has instituted community enrichment programs for 1,400 K-8 students, two pre-kindergarten “jump-start” programs for at-risk children and two mobile “preschools on wheels” reaching 120 underserved children. The Henderson-Hopkins school in Baltimore, the result of the collaborative effort of a range of partners, including the East Baltimore Development Inc. and Johns Hopkins University, to create an innovative community school and resource center to bring educational opportunities to students. The East Lake Foundation in Atlanta, which brought together cross-sector partners to initiate a cradle to career education as part of a comprehensive public housing redevelopment. The Bayou District Foundation in New Orleans, which made educational initiatives part of its core community revitalization strategy. These initiatives bring together public, private and nonprofit leaders and organizations around a common aim. “By working together and adopting a common strategy and goals…we can make a vastly larger difference in our children’s lives than we ever could working separately,” explains John Bennett, director of the Cradle to Career Initiative. Having spent his entire career working for and across different sectors, John, like many members of the ACF leadership team, developed a keen understanding of the different motivations and values that drive the private, nonprofit and public spheres to become involved in an educational program like CCI. John explains that public schools recognize the limitations of working in isolation and seek to broaden community involvement and support. Nonprofit organizations seek ways to increase the effectiveness and reach of their programs. Business leaders understand the importance of quality education to community vitality and thus the future success of their own enterprises. Philanthropists seek to amplify the beneficial effects of their charitable contributions and want to see how their support helps achieve important social change. Establish a governance structure refers to the creation of a formal or informal organizational system for project management. Clear governance structures, such as committees, workgroups or facilitated discussions, provide direction while ensuring equity and inclusivity to resolve actual or perceived power imbalances that can arise during collaboration. In the case of the ACF’s CCI, the Foundation decided to take a proactive approach. ACF leaders recognized that in order for CCI to achieve sustainable progress, ACF needed nearly 100 local leaders from diverse backgrounds to combine their efforts and resources into a unified action plan. ACF Director Tamara Tormohlen realized that such a complicated endeavor required a clear governance structure that encouraged participation, promoted transparency, held members accountable and created a shared community vision. To achieve this, ACF initiated monthly roundtable discussions as a way to incorporate all participants. Seating everyone in a circle encouraged consensus building while ensuring that everyone at the roundtable had an opportunity to contribute. If, however, the group failed to reach a consensus on a particular topic, the group would have a simple vote where members could either show approval with a thumbs-up, express concern or ambivalence with a sideways thumb, or express disapproval with a thumbs-down. If anyone voted against a motion, the group continued discussions on the topic until everyone at the roundtable either reached a consensus or at least voted with a sideways thumb. Eventually these community roundtables evolved into four self-selected action teams focused on the four high-level goals of CCI. Each action team had three community co-chairs and followed the same roundtable meeting and voting structure. Share discretion refers to the allocation of decision-making authority according to area of expertise. Assigning authority based on partners’ sector- or issue-specific knowledge allows the collaboration to benefit from the unique expertise of each partner and gives each partner a distinct stake in the collaboration. ACF leaders like Tamara and John facilitated early CCI roundtable discussions by both introducing and concluding each meeting. But when the larger community roundtable divided into action teams, each action team appointed three members of the community as co-chairs to lead each month’s discussion. Thus, ACF allocated decision-making authority and implementation to members of the community with issue-specific expertise. CCI participants also voluntarily chose which area of the initiative they wanted to focus on and therefore which action team they wanted to participate in. This ensured that everyone with a sector-specific stake in the planning process, like a local business with an interest in finding career-ready employees, had a distinct voice in the action team’s final outcome. Creating “Enrichment Wednesdays” in the Roaring Fork School District to engage students with the community and expand their access to tutoring, community enrichment programs, sports and outdoor activities, mentoring programs and career counseling with local business professionals. 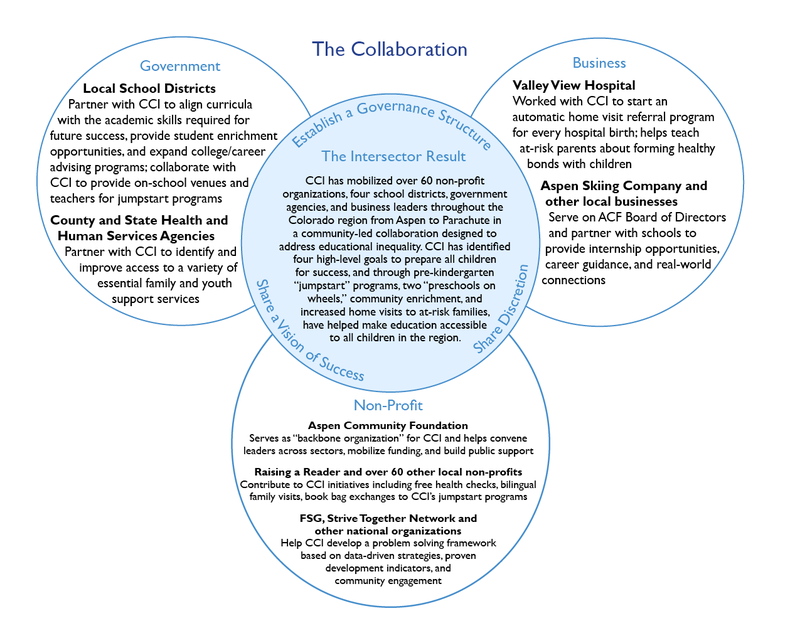 Contracting with CiviCore to link community resources through an Internet platform for use in connecting schools, organizations, students and families. Creating a monthlong “Boost Camp,” or academically focused summer camp for children ages 6–10 in Rifle to provide on-going learning opportunities for children who would otherwise not be able to participate in a structured summer program. 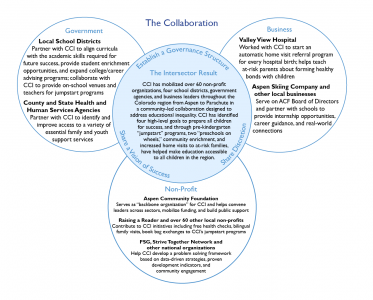 Read The Intersector Project’s full case study on the Aspen Community Foundation’s CCI collaboration here. Case studies on the other collaborations mentioned in this article, can be accessed in full online. Author: The Intersector Project is a 501(c)(3) nonprofit organization that seeks to empower practitioners in the business, government and nonprofit sectors to collaborate to solve problems that cannot be solved by one sector alone.